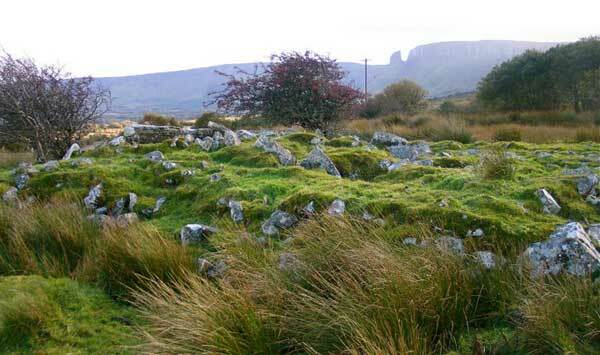 Tumpaunmore, the Hags Leap, an unusual formation at the east end of the Dartry Mountains. 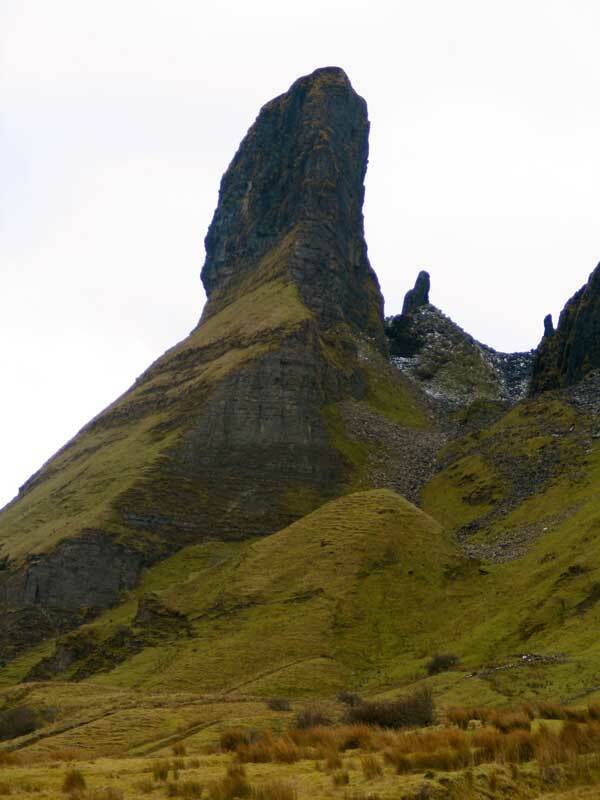 A Cailleach used to hop over and back from the pinnacle to the mountain. 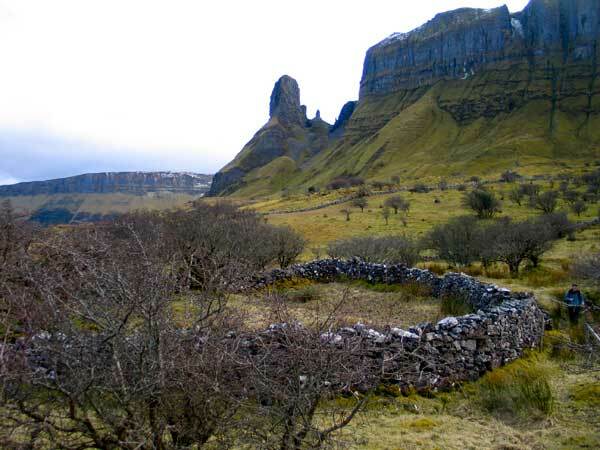 On the south side of Glenade valley, on the northern face of the Dartry mountains, in the townland of Cloontyplugrish is a fabulous geological formation, a land stack called the Hag's Leap. The stack was formed when a massive chunk parted from the north face of Tievebawn, probably on a faultline. The Dartry or Carbury mountains are composed of carboniferous limestone and are about 300 million years old. Tumpaunmore, or the Hag's Leap. The massive pillar of the Hag's Leap was formed during the last ice age as the retreating glaciers gouged out the Glenade valley. The cone shaped hill in the photo above is formed from gravel melting out of the ice. Though Tumpaunmore is the name on the 1837 OS map, I like the title the Hag's Leap, which was given to me by the landowner who showed me his megaliths in Sheskin a little to the north. 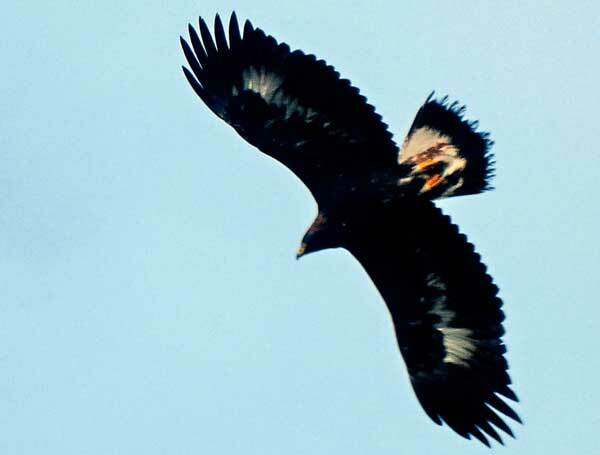 Eagles were a very common sight in Ireland until about a century ago when they were hunted to extinction. Photo © Simant Bostock. The cliffs called Eagles Rock, between the Tumpaunmore and Sheshin, must have been home to many birds of prey. There are lots of old empty cottages scattered around this side of the mountain, and an old track leads up past Eagles Rock to the top of Tievebawn. The kite shaped court cairn in the townland of Sheskin, looking south past the cliffs of Eagles Rock to the Hag's Leap. It was while visiting the court cairn in the townland of Sheskin that I first saw the Hag's Leap. This megalithic structure is up on a shoulder on the north eastern side of Tievebawn overlooking the Glenade valley, across to Arro mountain, and out across the ocean to the north. The monument is a large diamond or kite shaped dual court cairn. The site is fairly well preserved, probably due to its location above and away from the lower routeways. Like many court cairns it was probably extended over time. There are two chambers, the older looking chamber on the west side, and a possible later addition to the east. The cairn is about 35 meters long, and Anthony Weir reports a pecked line on one of the stones. There are two more megaliths directly across the valley to the north. The Hag's Leap viewed from a cashel under Eagles Rock. There are many monuments from different eras in this area. We found a round mound that looked like a barrow, but has an circular internal chamber built of drystone masonry. It may have been a hidden still house where poteen was made; on the National Monuments Inventory it is marked as a lime kiln. There are several mounds of stone and drystone cashels along under the slopes of Tievebawn overlooking the ancient routeways along Glenade valley and along the edge of the mountains. 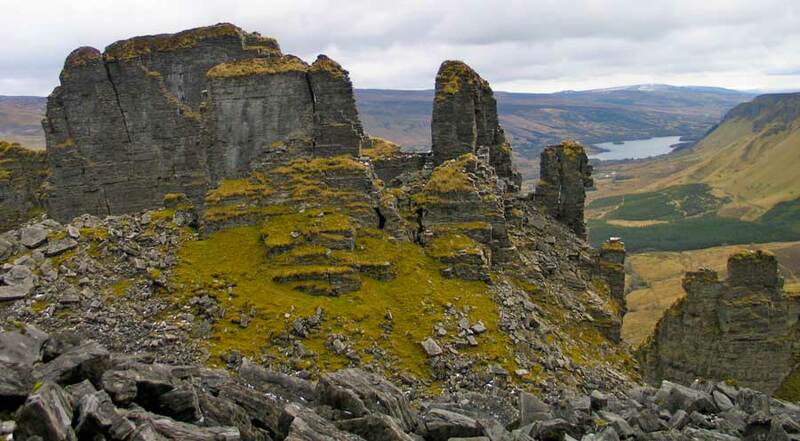 Tumpaunmore, the Hags Castle, an unusual formation at the east end of the Dartry Mountains, looking south down the valley of Glenade to the lake with its crannog.